Here we go again. An abundance of those red beauty-orbs from the garden is providing some very yummy meals around Hoe and Shovel again this spring. After a hot morning in the garden what better way to reward one's self than with a cool sit-down lunch in the shade on the back porch. A quick and healthy sandwich with thick slices of red deliciousness is a favorite here. Always remember the fresh ground pepper people! For a not-as-healthy rendition, but still sensible, add some of that sweet romaine lettuce picked the day before and some slices of bacon left over from breakfast that morning. Truth be told the extra bacon was prepared with visions of BLT's on the cook's brain. Oh, and of course, the rest of the tomato must be sliced and eaten as a side dish. One can never put half a tomato in the refrigerator. Oh, no, the whole thing must be eaten at one sitting. Lots of vitamin C you know. And with tummies full and satisfied we are back to the garden awaiting the arrival of the grand- youngins for the night. Food straight from the garden is always tasting so good. Meems - that sandwich looks so yummy! I can't wait until my tomatoes are done. It' true straight from the garden is the best taste! I've never seen tomatoes look so delicious as your photos! 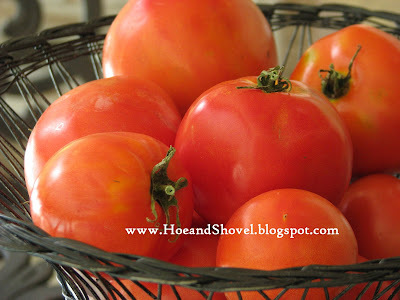 I so wish I would have planted some slicer tomatoes this year and not just salad tomatoes! Good, Good, Good. I had a tomato sandwich the other day. Store bought. Haven't had one since I was a kid. Will be glad when my tomatoes come in. I am growing Roma tomatoes, scallions, onions, and bell peppers for the first time. So far everything but the bell peppers are coming up. I am so excited! green with envy & green tomatoes. 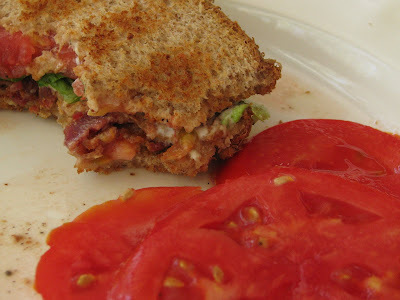 We are weeks away from a tomato sandwich around here ..
Oh My Goodness, Meems.. Everytime I look at your blog post --my mouth waters. 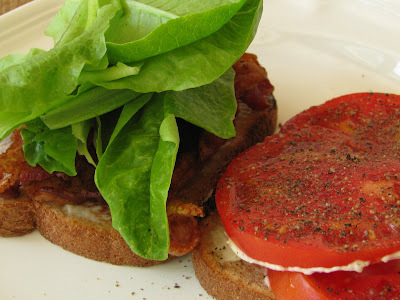 I love fresh tomatoes---and I love BLT's... YUMMMMMMMMMM..
okay that is just not fair...showing those delicious tomatoes while mine aren't yet on the vine. i can't wait to enjoy that great sandwich with plenty of pepper for me too. To grow those great tomatoes! Wow those toms look great! We are so jealous of how early you have things ready to eat out of the garden. Finally some of my home grown seedlings are looking solid at 8-10 inches tall, some others look terrible. yummy in the tummy! ahh, the fruits of labor for the home gardener - my favorite sandwich is a blt - i made one for myself saturday, only with store bought tomatoes - definitely not the same, but not being a gardener the best i could do - fortunately i can get vine ripe tomatoes at a nearby deli - and i love a delicious tomato sandwich with just a spread of mayo too - just a little lighter on the pepper please! btw, great antioxidants in those healthy servings of red orbs! it's a win/win for your taste buds and your health, not to mention the exercise you put into garden beforehand! I hope you DO get that straight from the garden experience... you will never want to be without your tomatoes after that. Thanks a bunch. I can't be without my slicers even though they give me a run for every ounce of my gardening patience. Will be happy for you when yours come in, too. Good for you... I am SO proud of you. Even if they don't do exactly as expected you will learn something in the process. And learning anything is invaluable!!! When I was in Savannah last (end of)June I ate some really good tomatoes from someone's garden there... not too far away. 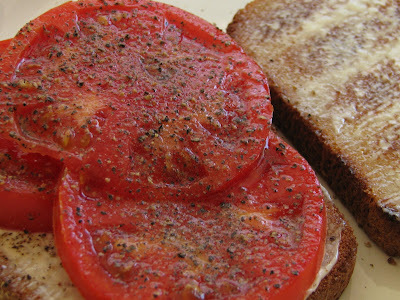 And last year was the first time I had had a tomato sandwich in years. The last would have been from my grandparents' garden and that is a great sense memory. You and me both! Good stuff. I add avacadoes, too... more yummy goodness. I'll have a good dose of envy for you when you are harvesting and all my tomatoes are long gone. Now that your seedlings are up - you know how that goes... they are going to grow SO fast. Those vine ripe tomatoes you buy at the market are not so bad... closest thing to garden grown and picked. I've got some of mine to share with you when you next can stop by. :-) Some beans, too. Our ground doesn't sleep here remember? Our veggies get started early and end early then we do it all over again in the fall. woo-hoo. I like that 'scrummy' word... Is that English or just a combination of words? We are really having fun this year with so much produce coming out of the ground. Beautiful tomatoes. These are what I most look forward to each year. Nothing better than a tomato fresh picked and still sun warmed. It's 11:07 and now your post has my mouth watering and my stomach growling! I may have to leave for lunch a little early today. There's nothing like a tomato from the garden. Just beautiful! OH MY GOSH, those tomatoes look SO good!